Excavated Shellac is back, again – continuing after four years, to keep up…well, at least a modicum of a schedule in posting international 78s. Again, I appreciate any and all comments, information, and collaboration – especially from some of the regulars who have consistently been following this website from the very beginning. Many marriages don’t last that long! So, I honor it, truly. Back in 2007-2008, I posted each week and wrote just a couple of paragraphs. Now, I post more or less monthly, and focus on records that for one reason or another would be interesting to both write about and listen to. Throughout much of the 20th century, music was recorded erratically in Afghanistan, to say the least. On top of that, according to various books on world music history, Afghan music has been, on the whole, largely undocumented. From my own collection, and from listening to the 78s of friends, the early art music of Afghanistan seems to situate itself as a bridge between the music of Iran and the music of India. This piece was recorded around 1959-1960. It was pressed and distributed in Afghanistan and elsewhere by the Russians on their state-owned label, although they did give the Afghan series their own lovely white label design. Most likely, it was produced by Radio Kabul, which was at the forefront of disseminating music of Afghanistan from the 1950s to the 1970s as well as, like many other countries at the time, developing a “national” music. Radio Kabul actually began in 1925, but the station was destroyed in 1929 when King Amanullah Khan, seen by many as too progressive, was deposed. Radio in Kabul was not reestablished until 1940 and after that, it became a center for Afghan music and its primary patron. In this piece by Rakshanah (whom you can see pictured at the bottom of this web page), you’ll hear the traditional Afghan rubab, the bowed sarinda (a relative of the sarangi from India), and the tabla, also imported from India. These are all essential instruments in Afghan court and art music. While I was unable to find any concrete information on Rakshanah, it is likely she was professionally trained and possibly from a wealthy family. Female musicians were not often heard in public in Afghanistan, as traditional culture and religion relegated women’s music to the home. A female musician wasn’t heard on the radio until 1951. From a musical standpoint, the 1950s-1970s were considered the most progressive era in Afghanistan – there were many women performers heard on a regular basis, regardless of the austere viewpoints of the conservative population. As far as I can tell, the very first recordings of Afghan music were the ones made in Lahore, Pakistan in 1926, by the Gramophone Company. Musicians from Kabul and Peshawar traveled to Lahore and recorded about 60 discs worth of material. The discs were distributed in urban centers of Afghanistan and throughout Afghan communities in India. (I have seen only one of these records in 10 years.) In 1928, a few more Afghan recordings were issued by GramCo. Between 1928 and 1946, the only outfit recording Afghan music with any degree of regularity was a local, independent company called The Frontier Trading Company based in Peshawar. They issued Pashto discs on their Banga-Phone label in India, along with music from Kashmir, Punjab, and Persia. (Again, I’ve seen a grand total of one of these records in 10 years.) After World War II, some Afghan recordings were made by Columbia, and issued in their Persian music green-label “GP” series. Then, there is the Russian-pressed series from 1959-1960 shown here. I have no idea how many were issued in this series – the numbering is erratic, though it could have been as many as several hundred. They were recorded on tape, and somehow connected with a company called “Afghan Magnetic Film” (or “Tape”… the records are not film music, though musically it’s very possible that they were influenced by the film music of Pakistan and India). Thanks to Alfred Madain, Garland Ency., Michael Kinnear. As some have seen on the Excavated Shellac Facebook page, an official announcement has been made for my next project with Dust-to-Digital, which is a Pan-African, 4-CD box set. It will feature 100 tracks from my collection, from all across the continent. It comes with a 112-page book and a CD portfolio, all housed in a hardbound cloth slipcase. I’ll be talking about this more in the near future. We expect it to be released in the Fall – late October or early November or so. This has been in the works for 3 1/2 years. It’s my goal to give you a diverse representation of some truly remarkable music that’s not before been issued. Also – guest contributor Ian Nagoski has a major box set just out on Tomkins Square, which will surely be of interest to readers. And David Seubert, another guest contributor, has been a major part of the National Jukebox project. There’s lots of great work being done – all of it, in most cases, a labor of love. After having unearthed my old copy of the Nonesuch LP Afghanistan: Music from the Crossroads of Asia recorded by Peeter Ten Hoopen, I think I’m ready to say that the artist here is actually Hamida Rokhshana, who sings one song on that LP. Ah… 1959/60… when the British record industry was getting away with heinous crimes against music by people like Cliff Richard and Russ Conway, and the Afghans were preserving sublime sounds like this for posterity. Even their record labels were far more beautiful! At the same time Ian Nagoski will launch his box set I will be launching mine featuring the fist great arabic singer ever recorded on 78 rpm (1905) Yusuf al-Manialawi. 10 CDs covering his works and a book of 250 pages presenting the singer. Congratulations, Kamal – please keep us updated with details. I am a great fan of Manialawi, as I’m sure many other readers are, as well! Good to see another posting on this venerable site and nice to hear this again after enjoying it originally at the JW archive recently. Can’t wait for more! This is a great year for box sets. I’m gonna need a bigger place. Congratulations on this major compilation. Years of studious research. Does the disc show the date of recording this song please? No, it does not. What you see on the label is all that is written. As mentioned in the text, I believe it was recorded around 1959-1960. Hi and thanks for this masterpiece from Rukhshana. 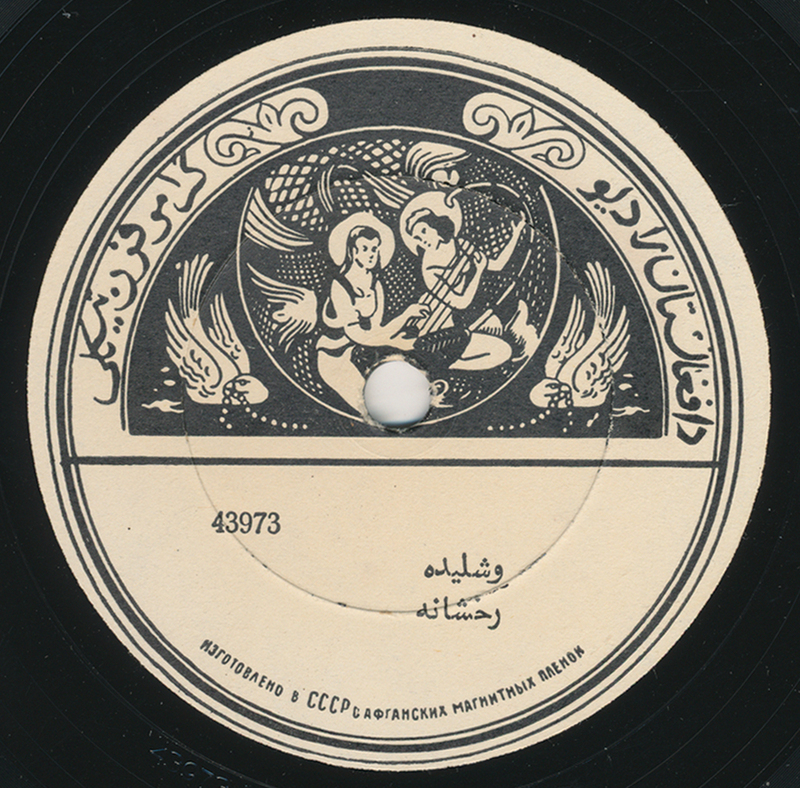 If i had the chance to find this 78rpm, i would take it immediatly…Afghanmusic will always be the greatest for me. Hi, thanks a lot for sharing this song.